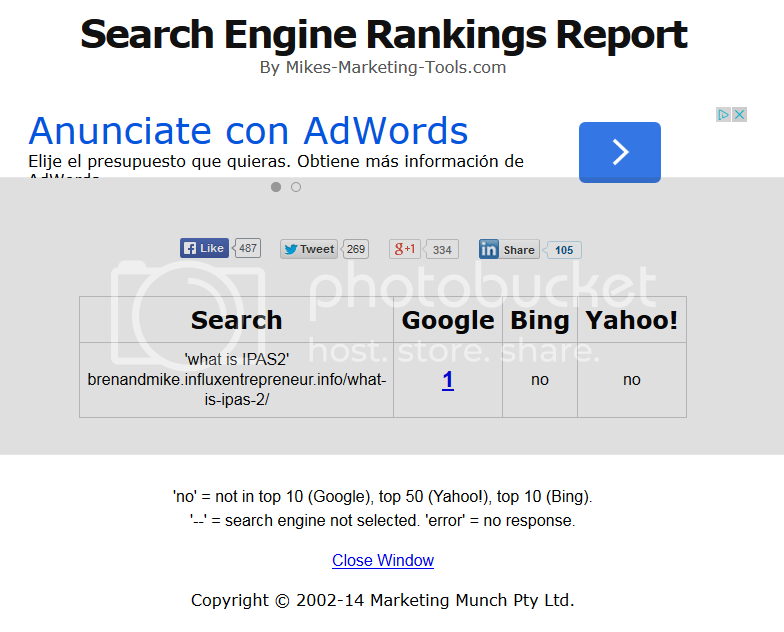 “How to Determine Your Search Engine Ranking” written by Mike Marko. You just wrote your best blog post ever. You researched the keyword, you optimized the onpage SEO (Search Engine Optimization), you made you backlinks, and you pinged all your URL’s. It looks perfect. So how well are you doing? This step is relatively easy. You go to Google, type in your keyword, press <ENTER>.. and Google tells you how well you are doing. The results you are seeing may not be accurate. Google will give you results based on your location, what you have search for previously, based on if you are logged into your Google account, and a variety of other factors. So the result you see is not the true ranking. So how do you get an unbiased Google result? You could log off your Google account, clear your cookies, and do everything else you can imagine and you may still not get the true result. Voila! That is all you have to do. This is a phenomena that I have seen, and I still haven’t figure out why it happens… if I do some good SEO and the page is only a day old I’ll often see my entry on page 2 or 3. Then the next day it will be gone completely, only to come back by the end of the week. Like I said I am not sure why this happens, but it happens to me nearly every time. It is like Google is sizing the webpage up and then decides to put it on the backburner for a while to see what happens to the page before ranking it. During this time it is important to keep backlinking the page to help ensure that it will have its place in Google’s rankings. There are a lot of way to determine your page ranking, but I recently found this cool tool that gives you the results for Google, Bing, and Yahoo. Using the tool, here are the results I got. SEO Quake is a plugin you can get for either Firefox or Chrome. And it’s free. SEO Quake doesn’t tell you your ranking in Google, but it does help you figure out what you need to do in order to improve your rankings. I zoomed into this screen shot so there is actually more information you can see with SEO Quake that I am not showing. I have just started using this tool, so I am just learning it. But what I have look at now is the “LD” field. It shows me the count of how many relevant backlinks I am getting that contribute towards that keyword. I also look at the “I” field because it shows me the Google index for each page. It basically tells me that Google is crawling my page over ten times more often that the next closest page in the rankings. Finally I look at the “Rank”. This is the Alexa rank each website has. The lower the number, the better your global ranking. So as you can see, based on these results our webpage is dominating for this keyword (in Google only… grrrrrr). If my competition saw this analysis they would realize that they have a lot of work to do before they would have a chance to take over this keyword. Blogging for SEO is a powerful way to get leads for the long haul. Keep an eye on your ranking, and look for ways to constantly improve it. 2. Why Choose the Kalatu Blogging System by Empower Network? 3. Why Blog – Will Blogging Help My Business Grow?